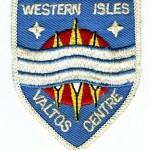 The Valtos Centre, based in the old Valtos School from shortly after it was closed, was first used in 1972 and developed over a couple of years until a visit there became a major fixture in the educational calendar for island pupils, and for scout groups and the like from further afield. Some notes from the Crowlista school log book in 1919-20. The school was located from both of the populations it served, Crowlista and Aird Uig, and there were recurring problems in getting the children to show up. There had evidently been a small school at Mangersta in the 1820s and in the neighbouring village of Carnish in the 1840s, but when both those townships were turned into farms there was no population requiring a school, until 1911. A picture from the early years of Uig School, with Crowlista school in the background. Most (nick)names now filled in, thanks to Donna, but we need a few more yet.